In late August I had a last minute assignment from Lowe to shoot their new range of Alpine Attack packs. As I also work with Rab and Lowe as a supported athlete they asked me to write a little about the logistics of how we got these images! August is prime time for alpine guiding and I had only one weekend free between three weeks of continuous work. Committing to the only available dates it was just going to be a matter of luck whether or not the weather would be usable for the proposed high mountain shoot. Lowe were nevertheless keen on shots of full-on poor weather climbing in we didn’t have good weather. However keeping the lens clean and getting reasonable shots in a storm is trickier than it sounds! 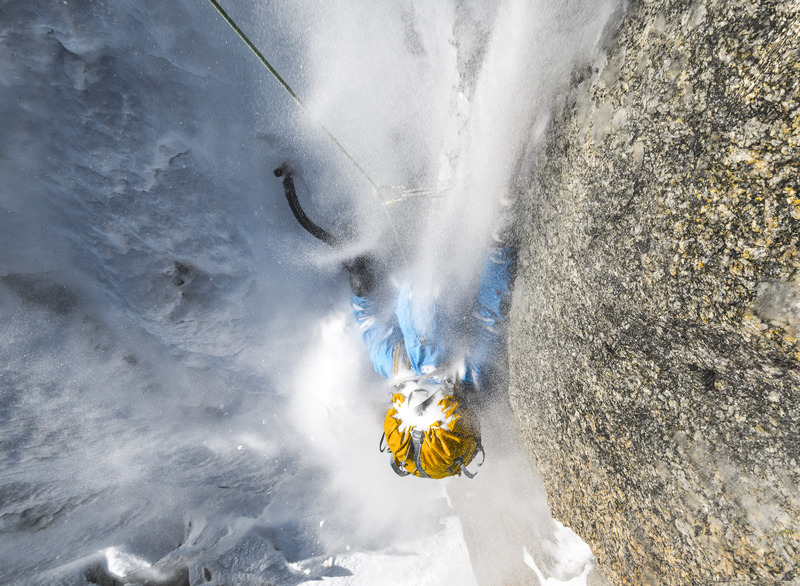 Victor Saunders getting pummelled by spindrift on a goulotte variation of the Migot Spur, Aiguille du Chardonnet. 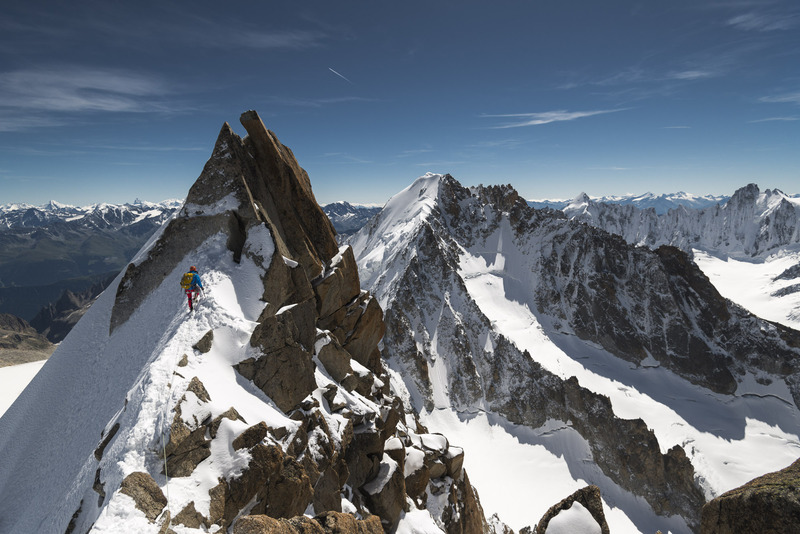 We had discussed a variety of more ambitious route options to shoot over two days, such as the Rochefort-Jorasses traverse, or the Brouillard ridge. In the end it snowed heavily with strong winds during much of the preceding week which discouraged these plans. 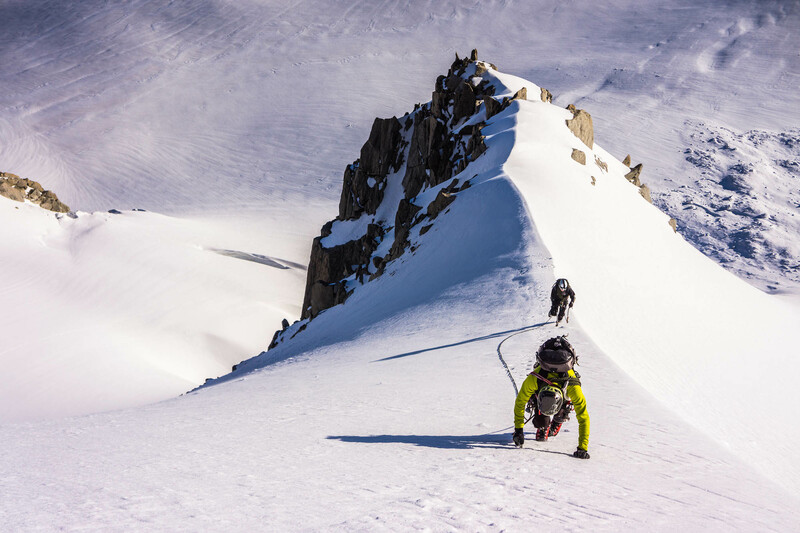 I arranged Victor Saunders, an IFMGA guide, and Valentine Fabre, a French mountain military doctor, to help with the shoot. Thankfully the weather cleared up and we had a perfect forecast as the weekend arrived. Valentine fixing a belay at the bergshrund of the Migot Spur. 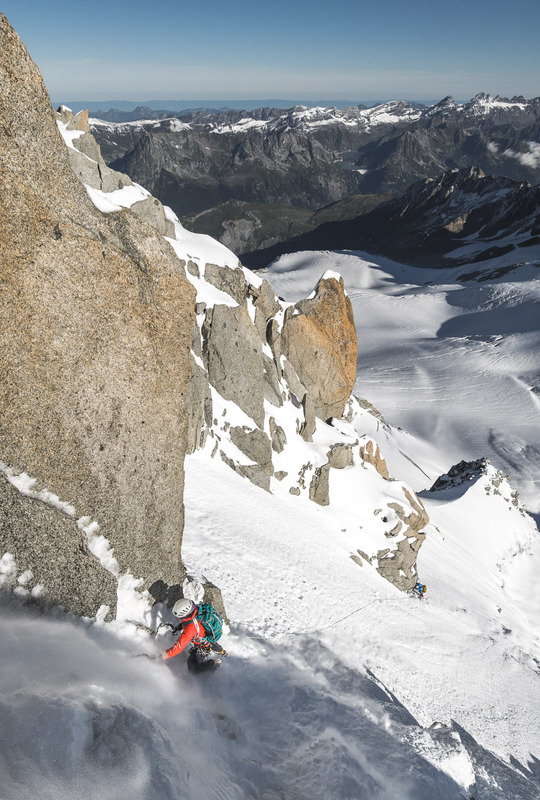 We headed up to the Aiguille du Chardonnet with a very open mind to see whether the snow conditions on the approach were safe, or to head elsewhere if not. No-one had been up for over a week, but the forecast was excellent and several teams had put in a track ahead of us in the morning. 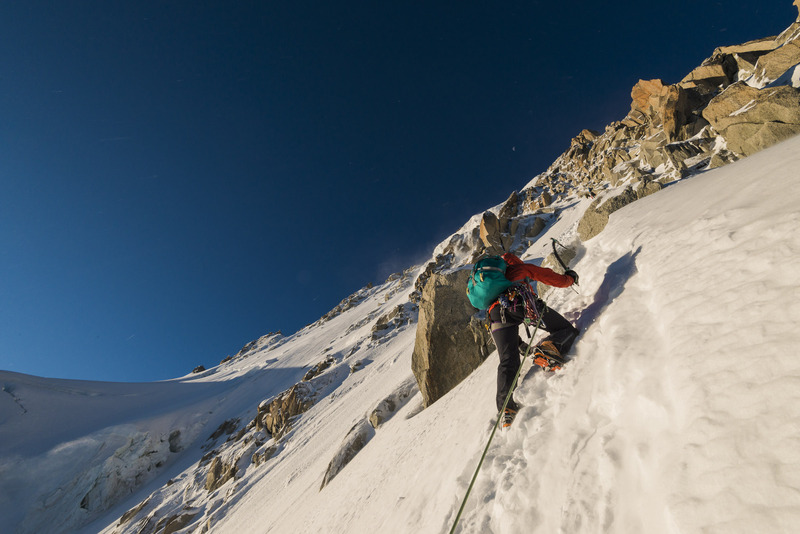 There was no evidence of the wind slabs we had suspected so we got onto a classic snow and mixed route called the Migot Spur, which divides the north face in half. The plan was to shoot a real climb, rather than move back and forth posing along one small section of easily accessible route. This is a documentary style applied to a commercial assignment… it has its pros and cons. 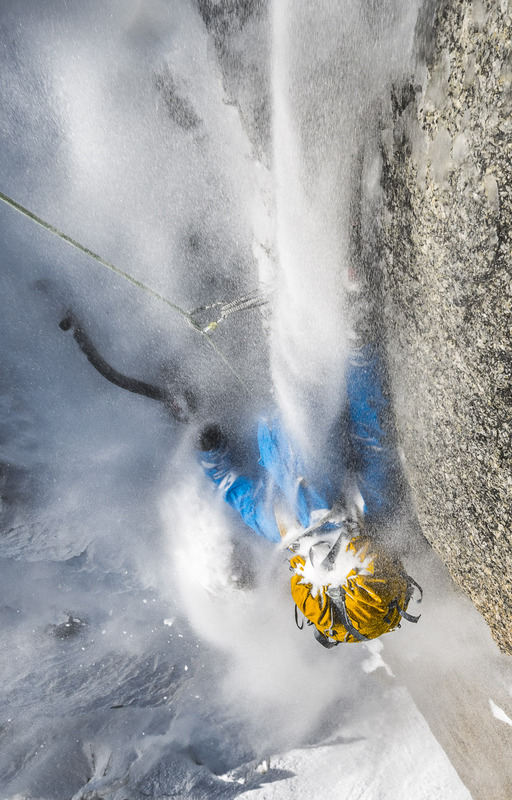 The pros are usually achieving very natural looking climbing imagery. Victor clearing his glasses of snow after the goulotte pitch. The cons are that to capture decisive moments you usually only have one shot, which requires quite a lot of concentration and luck. There is little time to pause and reflect on how to redo the same action better, or from a different angle as one might on a posed shoot. It means one has to be much more reliant also on good timing and luck to control the lighting, which could often be better with a little help from flash or testing different angles. 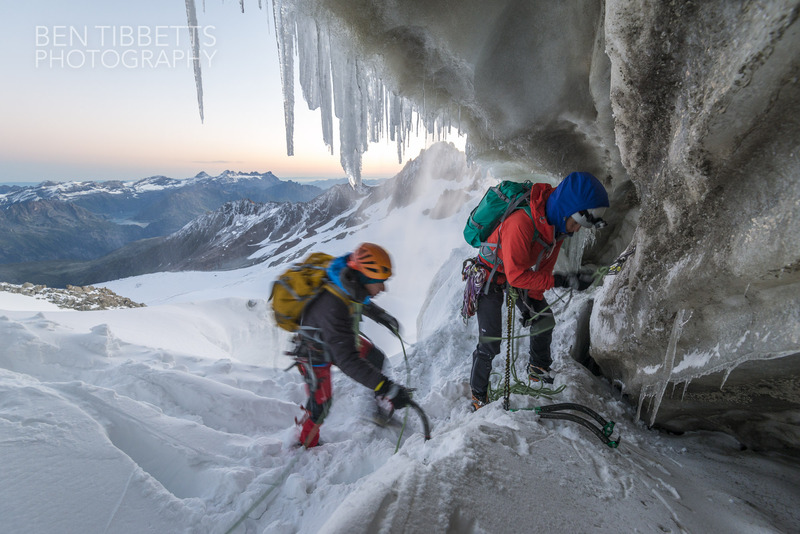 Misha Gopaul and Stuart Johnston on the Migot Spur on a previous trip. We had had a later start on that occasion and the sun was already high in the sky, but it gave me good ideas as to what might be possible. I remembered clearly the potential for a more atmospheric sunrise shot, with the sun in the frame rising over the far ridge to the east. It was a cold day however and spindrift was pouring down the north face due to a southerly breeze so there wasn’t much scope for hanging around for an hour to get a certain shot. 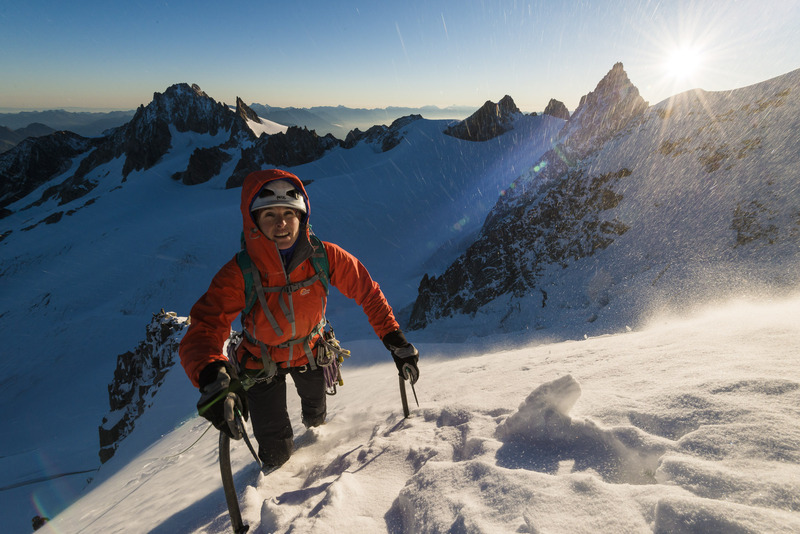 Valentine at reaching the main ridge of the Migot Spur at sunrise. Fortunately we got the timing right to hit the ridge near sunrise, and get some shots at the base of the spur with strong warm light pouring across the face. The spindrift was blowing about in eddies though and every few minutes I had to get out a cloth to clean and dry the lens out. There were other teams on the route and so I was moving around trying to get shots of my team, whilst neither compromising other teams movement nor getting them in the frame! Above us two teams were getting channelled into the same mixed gully of the normal route. View up the mixed ground – Valentine heading up and then off left as one can make out another two parties straight up. As I remembered the rock on this route doesn’t yield many belays and I could see we would end up having to move slowly and have difficulty keeping clear of other people. Way off to the left of the route I spotted a series of much steeper ice runnels that had a little more east face in them and looked like they would be catching the sun for another hour or so. We moved up and over the base of these and were back on our own. View down the lower part of the route from the first steeper pitch. It looked like the perfect place to shoot some images of the team on steeper mixed terrain. I tied into the 30m rope I had bought for myself and got Valentine to belay me up the first pitch. 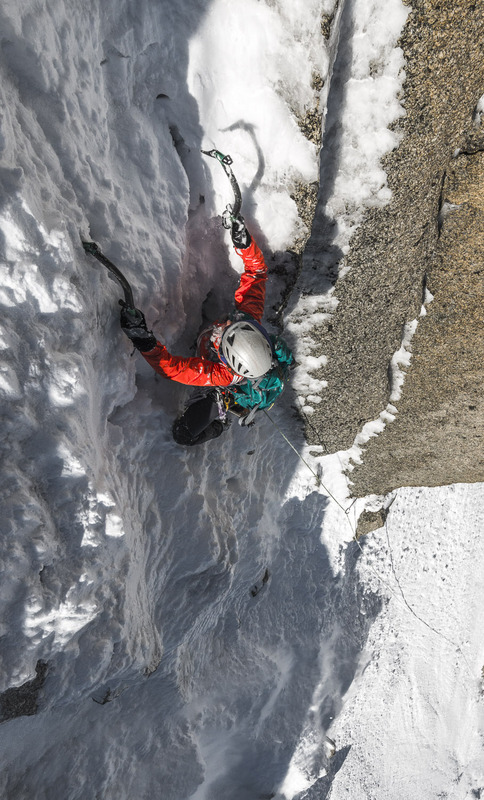 I had expected it to be straight forwards, giving me lots of time to then pull up my rope, abseil back down on a fixed line so I could jumar up the rope taking photos beside Valentine as she led the pitch. Time was critical as the sun was steadily moving round and off the runnels, and the shots I had visualised wouldn’t be possible. Valentine leading up the goulotte. In the end I found the ice to be much less helpful than I had expected and I found myself groping at the rock slabs underneath. I inched my way up ripping off most of the hollow crud that I had mistaken for névé. For nearly and hour we had been relatively sheltered from the spindrift, but then all of a sudden it began again. Wave after wave poured down with enough vigour to unbalance me at the wrong moment. I put my hood up, cinched my sleeves but it soon filled in behind my sunglasses, down my neck and into my mouth. To top off the situation the pitch was pretty poorly protected – the ice was too hollow to take screws, but underneath was 80 degree granite slabs with blind icy cracks in the corners! I was very relieved to find a belay spot, but it took me at least twenty minutes to dig out some usable protection – a thoroughly Scottish experience! I had taken much longer than hoped so the lighting for Valentine’s lead had moved beyond optimal which was frustrating. More so was the deluges of spindrift that made shooting much of her lead impossible as the lens got wet between every shot. 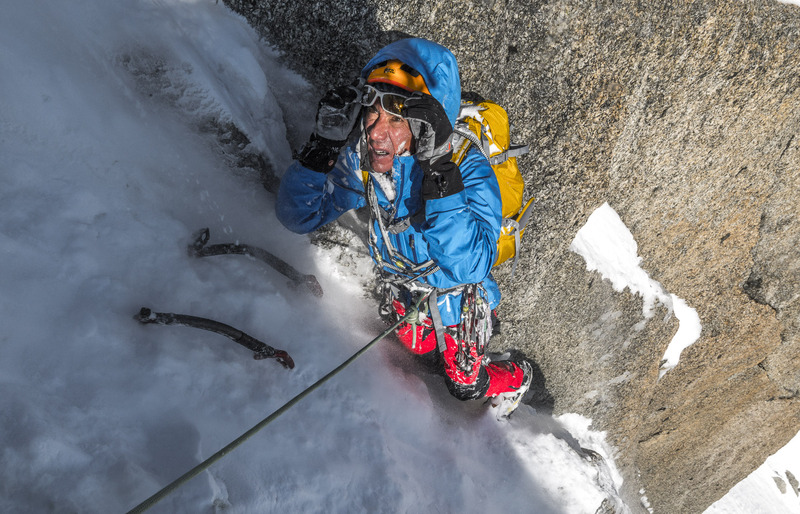 By the time it came to Victor seconding the pitch the spindrift had become nearly continuous. However I managed to find just enough shelter inside my jacket for a few minutes to dry the lens out with a cloth. I then descended back down to beside him and shot at arms length using my whole body as an umbrella for the camera. My body began to cramp up from trying to jumar the rope with one hand whilst twisting my body round over the camera in my other hand. Nevertheless I got lucky and kept the lens clean for enough time to yield a few images that I find quite exciting. It is moments like these that you can not really plan for or stage on a shoot. When they come at you the best you can do is embrace the moment and keep on shooting no matter what!